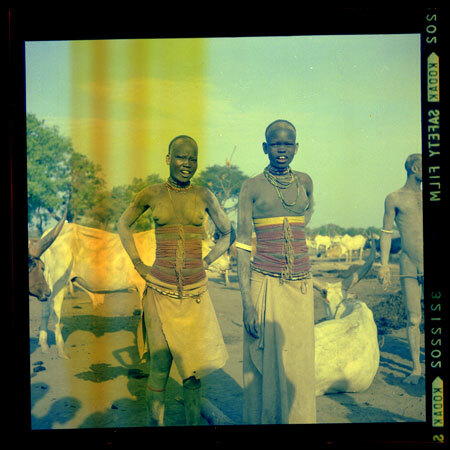 A three-quarter length portrait of two young Mandari women in a cattle camp wearing textile waist cloths and a large number of mostly red bead strings around their waist, as well as some around the neck [poor negative]. Such bead strings were often given to young women by courting male youths. Youths wear such rem beads as a way of denoting their age grade grouping and for display. Morton, Chris. "Mandari women" Southern Sudan Project (in development). 03 Jan. 2006. Pitt Rivers Museum. <http://southernsudan.prm.ox.ac.uk/details/1998.97.90/>.